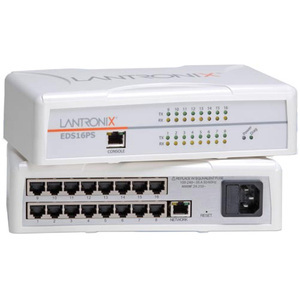 The EDS16PS is a unique, hybrid Ethernet terminal/multiport device server which allows remote access to and management of virtually any IT/networking equipment or edge device like medical equipment, POS terminals or security equipment. Featuring Lantronix's powerful Evolution OS, EDS delivers an unprecedented level of intelligence and safety. With AES, SSH and SSL built in, EDS provides enterprise-level security allowing safe remote access and management from practically anywhere. With no special software required, setup is a breeze with Lantronix's Windows-based DeviceInstaller, which can be used locally or remotely using Telnet, a web browser or XML. Evolution OS provides 'data-center grade' protection so each networked device carries the same level of security as corporate data center equipment and provides robust defenses to hostile Internet attacks. A "Cisco-like" command line interface (CLI) simplifies configuration and control, making it easier to integrate edge devices or data center equipment into the network.